Family Men Don't Wear Name Brands: Gardener? For What? My dad took care of his yard work. My grandfather took care of his yard work. I’d be darned if someone else would do my yard work. I’m a Picarella man. I’ll do my own work, thank you very much. I told my wife all of this, and then I said, “I have spoken, and that’s that,” which basically means nothing these days. So my wife and I spent another three hours arguing about whether or not I should give up the landscaping duties at our home. 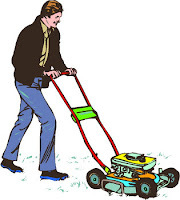 From a bystander’s perspective, I might’ve looked like a big dummy, fighting to do manual labor around the house, which was especially dumb since the matter had nothing to do with the cost of a landscaper. We could afford a landscaper. My wife pointed out that I hadn’t even mowed the lawn in over three weeks when it should’ve been done on a weekly basis. I had to admit, the landscaping looked bad. But I’d been busy at work and just didn’t have the energy or time to break out the lawnmower and garden tools and spend half my weekend maintaining the place. And that’s how I lost the argument with my wife. We got a landscaper the following week, and I have to admit, it was nice not having to do the work. I was able to spend more time with my family, I could rest after long days of work during the week . . . Life was great! “I’m not criticizing you,” my wife said. I knew then that I should’ve never agreed to hire a gardener. Now my wife had one more reason why she could do without me. I needed to protect my job as a husband, not terminate it. So, in September, we got rid of the gardener. I became useful again. And I’m a “real” Picarella man again, like my dad and grandfather, doing the yard again. After firing the gardener, I spent that first weekend -- the entire weekend -- working on the front and back yards, and I must say that our landscaping never looked so glorious, so rich, so green and so lush. I was very proud of the work. My wife even recognized the visual splendor of the place. The next week, I spent a little less time on the yards. I skipped the following week’s yard duties altogether since I was out of town. Once I got home, I didn’t make up the work. And I didn’t do it the following week either. This continued on until we got a letter from our homeowners association regarding a lack of yard maintenance. I was a bit embarrassed. My wife was upset. Today, the landscaping looks great again -- better than ever. And my wife is very happy. I must say it’s good to have the gardener back.